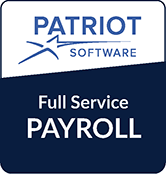 Since you are looking at this page, you may be exploring the online payroll solutions and you may have run across Patriot Software. Good news! We are certified Patriot Advisors. Whether you want us to do your payroll or you want to do DIY, their offerings are high quality, but software simple and inexpensive. When you go to their site, you can sign up for a sample account that’s preloaded with sample data in case you want to do your payroll yourself. If not, you can contact us about taking over your payroll and contractor pay. This way, you can explore their software and services in advance without wasting time. Either way, it’s a pretty interesting concept. When you get a chance, check them out. Furthermore, we’ll be happy to go over our offerings, as well as explore other options. Need simple and affordable payroll? We recommend either of these two options from Patriot Software. Why? 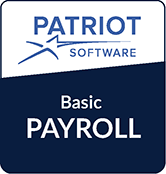 Because Patriot offers a 3 step payroll process that's easy, and they guarantee the accuracy of their payroll calculations and tax filings. Run payroll in 3 simple steps. You enter your work hours online. You deposit and file your payroll taxes yourself. Unlimited number of payroll runs. You enter the hours, Patriot does the rest. You enter employees work hours online. Patriot verifies your payroll taxes are withheld and deposited. Patriot files your federal, state, and local payroll tax returns. But Don't Forget... we offer 1099 contractor payment solutions as well! Looking for simple 1099 software to pay your vendors and print 1099s? We recommend this easy tool to get you started. You pay your bills, and print 1099s yourself. Don’t want to uses Patriot? No worries! Most noteworthy, we work with other software as well. A few options we recommend are Gusto, QuickBooks, or Xero’s. With QuickBooks and Xero, you also have many app add on features. Also, Gusto fully integrates with both software systems in case you want a more robust external system with HR offerings. So, all of these options come with great features and benefits. Furthermore, all offer tax filing options, direct deposit, ability to add benefits and PTO tracking. Likewise, having your payroll in your accounting system also makes sense since its already integrated into your bookkeeping. Finally, having your payroll entered into a system helps track costly mistakes just doing by hand on your own and helps make the W-2 season less painful. Another great tool we recommend and use ourselves is TSheets. Service based businesses using a time tracking system find the benefits outweigh any additional costs. Also, we think you would love TSheets time tracking for your business! Above all, employees can track time on any device, you can easily integrate with Gusto, QuickBooks and Xero for payroll, and the customer experience team is phenomenal! There are tons of amazing features offered by TSheets, try it free for 14 days by clicking here.